One must get a satputra [ an able son ] to get absolved of pitru runa [ debt of forefathers ] . To live a carefree life one needs ample wealth and riches … These riches should not result in pride [ durahankara ] but instead we must gain Nishchal bhakti [ unmixed devotion ] towards HARI … One who has this type of bhakti ,even if he has wealth and riches pride does not touch him . The love towards GOD Hari is known as bhakti . This love should be infinitely greater than the love that we harbour towards other things . In whatever circumstances whether of good or of highest danger , this love should not cease nor should it decrease …Such type of PARISHUDDHA bhakti comes by the knowledge of HARI sarvottamatva .. Knowing that HARI is supreme , none is or was or will be ever equal or greater than Vishnu is what is known as HARI SARVOTTAMATVA gyana …To get this knowledge one must have clairvoyant VIGNYANA …This Vignyana comes by relentless study under an able GURU and it increases by relentlessly imparting the knowledge to able students . To teach as well as to learn one must have able body and speech .. Once a human body is acquired one cannot remain without karma even for a second . AMong these karmas ,sins are in majority as life passes .. And also as the body commences its journey it encounters diseases … As long as these diseases and sins exist [ or habit of sinning or sufferings from disease exist ] no learning or teaching is possible .. rather such a learning or teaching does not give rise to Vignyana …nor does it increase Vignyana which is chiefly responsible for Parishuddh Bhakti .. which gives real enjoyment [uninterrupted unabashed ] of progeny and wealth . Thus Oh Guru RAGHAVENDRA save us by destroying [ hatva] these sins and diseases and give us PARISHUDDHA bhakti along with satputra and wealth that would increase vigyana and having granted[ datva ] you [ sah ] protect [ avyaat ] us [ nah ]. At that time Guru Raghavendra was seated in the japa of HAYAGREEVA , and hence a divine voice exclaimed …...” SAKSHI HAYASYOTRA HI “ thus completing the shloka and endorsing that whatever has been proclaimed in the stotra by Appanacharya is true and LORD HAYAGREEVA will be a witness for the long time to come or Lord himself will oversee its truth . This incident took place in the year 8-8-1671 . This stotra has exclusive stamp of Guru Raghavendra and LORD HAYAGREEVA and thus carries special place in the hearts of MADHVA devotees and is extremely potent in delivering quick instantaneous results and wish fulfillment like kamdhenu and kalpavriksha . May all the readers of this blog be benefitted by the translation of this stotra from today onwards and may lord hayagreeva fulfill their wishes . Appanacharya in the opening stanza compares the speech [ vani ] of Guru rayaru with that of GANGA . Just like GANGA let his voice purify us from sins . 1. Bali chakravarty performed the 100th ashwamedha yagnya and LORD VAMAN asked him land covered by three footsteps . When BALI agreed , with one foot Lord covered entire Bhumandala with his second step he covered entire upper heaven seven lokas , while he was measuring his second step as he raised it to the upper crest of the UNIVERSE BRAMHANDA , the upper crest cracked as his nail of the toe touched the BRAMHANDA katah . The Bramhanda kharpar is the inner layer of the universe and externally it is engulfed by the jalavarana the [ prakruti water ] . 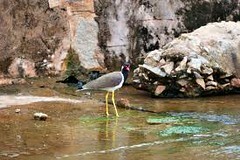 This water entered the crack and touching the LORD’s feet washing it , fell through the different LOKAS . As it gushed through the Lord TRIIVIKRAMA’s feet [ hari pada prakshalan jala ] Bramha immediately took it in his kamandalu and again offered it to the feet of Lord Trivikrama [ Lord had appeared for the first time in this roopa and Bramha worshiped him by washing his feet and what more better [pure] water could he get than this new water gushing out of BRAMHANDA [ an out of world experience for the very creator of the world ] . The same water as it was flowing with unabashed symphony , RUDRA held it in his jata [ hair locks ] and became purified , [ we always take VISHNU TEERTHA and sprinkle it on our head ] but RUDRA permanently keeps VISHNUPADODAKA in his locks , he is everpure and a great BHAGAVAT . As it flowed further , it became sacred in INDRA LOKA and in SHimshumara loka DHRUVA worshipped and many rishis and devtas worshiped it as progressed , and finally as it fell on the MOUNT MERU , it divided into four streams in four directions ,. and culminated into the waters of ocean in the jambudweepa . This ganga is like GURU Raghavendras’ Voice [speech ,teachings ] as people bathing in this river gets rid of the sins and the mal [dirt ] is cleansed ,vimali karotu , so also Guru’s words cleanse our sins and purify the devotees . Usually poets when they use comparasions ,they compare very qualitative object with the subject , like face with a moon , moon is far more beautiful than human face , yet poetic liberty passes it off .so upamaan and upameya [ moon and face ] are out of place , but here Raghavendra ‘ teachings speech vani vak is not compared to GANGA , but GANGA itself is compared to Guru’s vani suggesting Guru RAGHAVENDRA’s teachings are far more sacred than GANGA because . Ganga cleanses the sins of people who chant its name , who seeks its blessings by visit and who take bath in the ganges . Such a bath cleanses the sins and purifies , resulting in clean mind taking to shravan [ listening ] of shastras , and finally leading to the knowledge of LORD . Ganga by itself does not arise the knowledge of LORD after cleansing . BUT guru’s teachings not only cleanses the sins and purifies but also practically imparts the knowledge of LORD and there by giving MOKSHA , Ganga is aid to MOKSHA but Guru’s words are assurity of MOKSHA and thus greater . because such a quality exists Our acharyas are also known as SRIRAGHAVENDRA teertha . teertha is ganga [ or river like ] . Let such words of guru cleanse our sins . Now this GANGA [ and also GURU RAGHAVENDR﻿A ] is praised through five adjectives [ visheshana ] . firstly we shall see how this adjective applies to GANGA and than to Rayaru . sri purna – full of brightness , bodha – budha , guru – father [ budha’s father moon chandra ] , teertha – birth place , payodhi – ocean , para – encompassing [joining] , rightful owner . ganga finally joins ocean and hence ocean is one and all for her . such a ocean when churned gave rise to the moon and this moon gave birth to mercury who was full of brightness right from the birth , thus this quality is primarily in the GANGA . Shiva is ever engaged in the dhyana of NARAYANA and thus can see him and all the knowledge through his eyes and hence he is maksh [ one who can see the knowledge of NARAYANA , aparokshagyani ] he is blessed with a third eye of agni along with usual two eyes , this third eye has burnt down even kama manmath when he tried to disturb his penance , such a SHIVA ‘s head is always wet with the touch of GANGA , and ganga has this distinction of being in his hair locks . purva uttara – ganga flows perpendicular to east and west direction , [ ganga flows in nORTH south direction in bharat varsha ] , amit – limitless , taranga – waves ,charat – flows , suhansa – great swan raj hansa . Ganga flows like a raj hansa through its limitless waves perpendicular to east west direction . deva – deities devatas, aali – pankti ,line , array ; sevita – worshiped by , para – LORD anghripayoj – lotus like feet ; lagna -engrossed in [ connected to ] . the array of devatas line up to worship the lotus feet of LORD , which is the origin of Ganga and she is always conjoined and engrossed ever attached to the feet . so also the Devatas . crocodiles have uneven faces and making unbearable noises and are very wild animals which can engulf swallow sheeps and even bigger among animals like elephants when they come to drink water in the rivers . Ganga is full of such wild crocodiles which are famous for the strength in the world . Now these five adjectives let us see how it applies to GURU Raghavendra . Humans have natural tendency to cheat ,to misrepresent , to lie .Humans also are susceptible to doubts , ignorance and false incorrect conclusions[ vipareet gyana ] . With so many defective tendencies , human deliverables cannot be accepted or brought into practice or considered as supreme truth , Any writings having its origin in human or authored by human cannot be accepted as supreme truth . So only those teachings which do not have human authorship [ which is not outcome of mere human intelligence and also has allegiance to apaurusheya ] can be believed . Vedas are apaurusheya and as they are not written by anyone one can completely believe in it and there can be no objections to as it does not have any defects . Any grantha [ subject ] should be read with complete faith and belief only then its contents will be understood or conveyed . If someone reads without any belief in any scripture , he may not benefit from the said scripture . Vedas declare ” ananta vai veda: ” thus vedas are infinite . it has infinite concepts . thus it is ocean of a very big shastra . guruteerthapayodhi – guru – very big [ infinite ] ; teertha – shastra ; payodhi – ocean . vedas are thus complete knowledge and infinite ocean of concepts . para – moola origin . This veda is the moola or origin or sarvasva [ everything dear to ] the VANI speech or teachings of Guru RAGHAVENDRA . Voice /teachings of SRi RAGHAVENDRA has its origin in the VEDAS which is full of complete knowledge and is ocean of infininte concepts . 1a . Does this Veda impart anything useful or any timepass subject . Does it convey anything of prime importance , or anything about the supreme . the same word sri purna bodhaguruteertha removes this doubt . This veda encompasses SRI LAXMI devi ; POORNA – LORD NARAYANA ; BODHAGURU – jagadguru VAYUDEVA [ one who imparts knowledge to the world about SRi and NARAYANA who is purna complete ] and one which conveys these three entities TEERTHA – shastra is veda , and such a veda is moola for RAGHAVENDRA GURU’s speech . VEDAS have no doubt in calling LAXMi devi as SRI . Is NARAYANA called as PURNA , veda pramana is ” ath kasmaduchyate bramheti , bruhanto hyasmin Guna: ” sakalkalyangunapurna NARAYANA is BRAMHA the PURNA . Veda proclaim the greatness of these three thus Vedas are known as Sripurnabodha guruteertha . 1b . These three entities are highest in the entire creation , and their knowledge is important in getting their blessings and their blessings will lead to MOKSHA and thus Vedas are indeed useful to the mankind , it is just not a scripture but MOKSHA giving scripture . 1c. Can Vedas be deciphered , which other things should be resorted to , to understand VEDAS ? Again the same word answers this question , Sri PURNA bodha , Bright with Filled KNOWLEDGE is LORD VEDVYASA , his teertha infact guru teertha means many shastras like 18 puranas , mahabharata , many vidyas upapuranas etc should be resorted to decipher vedas and para – all encompassing these are the speech of GUru RAGHAVENDRA . Lord VEDVYASA is no doubt full of complete Knowledge , but Vedas contain opposing sentences but yet Vedas say they are all correct . Thus many doubts arise with respect to efficacy of vedas in light of mutually opposing statements , Therefore to reconcile these differences VEDVYASA has written puranas and MAHABHARATA . 1d. IF there arises differences in PURANAS and its statements then what should be done ? the same word Sripurnabodhaguruteertha solves it ! Sripurnabodha – Vedvyasa has written guru – much infinite in meaning [ though fewer in letters and words ] teertha – bramhasutra and these form the basis of RAGHAVENDRA swamy’s teachings . 1e. But these SUTRAS were completely misinterpreted by various scholars ? Sri -VEDA [ laxmi abhimanya ] Purna – complete Bodha – understanding havingAcharya Srimadhva has wriiten GURU – multiple infinitly deliverable teertha – sutrabhashya sarvamoolagrantha is the moola for teachings of RAGHAVENDRA . Madhvacharya has learnt practically from SRI VEDVYASA only in badrikashram and with his permission he has composed SUTRA BHASHYA and SARVAMOOLA Grantha which is dear to RAGHAVENDRA teertha . and his tecahings reflect them . How can we say that ? SRIPORNABODHA is MADHVACHARYA , one who has MADHVACHARYA as a GURU is SRI TEEKACHARYA JAYATEERTHA . Sripurnabodha : guru: yesham te sripurnabodhagurava: , tesham shastram !! 1h lastly RAGHAVENDRA guru ‘s followers to come in his lineage like SUmateendra teerth will also have the same moola like our Guru’s vani to impart such infinite knowledge . Our Guru Raghavendra’s teachings have the approval of KAMARIMAKSHVISMAKSH ie SHIVA [ Rudra ] who gives his approval by shirah sprushanti – by nodding his head .It touches the head of RUDRA as he rejoices in his approval for the speech has its moola in VEDAS . Is SHIVA approving just for the sake of it , has his approval any special importance yes , because this is the same lord shiva who has won the manmatha, he has the knowledge of NARAYANA so practical that he can see him and and he is the one with a unique odd eye ,eye of AGNI the symbol of purity , so his nod is very auspicious and makes our GURU’s voice very special . suhansa – great paramhansas [ sanyasi of highest order ] and Guru RAGhavendra ‘s voice abides by these . normally when studying a concept its relevance to poorva and uttara mimamsa has to be studied under able guru and hence guru is served with utmost honour and devotion to imbibe such difficult concepts , MAny gyanis have known such deep knowledge by abiding by the vani of Sri RAGHAVENDRA . the bees always buzzes around a lotus for the honey , similarly devatas always hover around the lotus feet of LORD and keep meditating on it and are engrossed in it forever similarly RAGHAVENDRA guru’s VANI is always engrossed in LOTUS feet of LORD . sameta – inclusive is the voice of RAGHAVENDRA . hile establishing the MADHVA concepts RAGHAVENDRA’s teahings and voice is full of logic like a group dangerous crocodile which can swallow in single attempt the durvadi the debators of illogical and irreligious beliefs . Let such VANI / speech of our GREAT GURU RAGHAVENDRA cleanse us off our sins and lead us to MOKSHA . SRIRAGHAVEDRA swamy’s voice conveys the meaning of vedas , in accordance with Vedavyasa and his teachings , elaborated by MADHVACHARYA , jayateerha till the guru sudheendra teertha of RAYARU and also forms the base for other yatis in parmapara like sumatindraterrtharu etc . It has nod of RUDRA and other devatas , it is acceptable to thse devatas also . many paranhansa have abided by it , it is very deep , and describes the lotus feet of LORD NARAYANA , with terrible and strong logic it destroys the opponents [ durvadis ] and upholds the difference between jeev and parmatma . establishes hierarchy , extols NARAYANA as poorna complete and sarvottama and declares this world as real . HIS speech is sacred as GANGA , more than ganga it is potent in removing the sins of devotees and lead them MOKSHA . SVA – YOUR , PAAD – FEET KANJ- LOTUS , DVAY-PAIR , BHAKTIMADBBHYA – THOSE WHO HAVE DEVOTION , SAKALAPRADATA – WILL GRANT ALL THE WISHES . KSHAMASURENDRA – DEVATAS ON THEEARTH [ BRAMHINS ] AND YOU ARE LIKE INDRA TO THESE BRAMHINS WHO ARE LIKE DEVATAS ON THE EARTH . MAAM – ME SADA – ALWAYS AVATU – PROTECT . JUST AS BEES KEEP CIRCULATING AROUND THE LOTUS FOR HONEY ,LIKEWISE DEVOTEES SHOULD ALWAYS BE ENGAGED IN THE MEDITATION OF THE LOTUS FEET OF RAYARU . SUCH DEVOTEES WILL GET ALL THEIR WISHES FULFILLED . THUS RAYARU WHO IS FIRST AMONGST THE PEOPLE ON THE EARTH ESPECIALLY SURAS[ DEVATAS ON THE EARTH ] ALWAYS PROTECT ME. In this world there are mnay types of nidhis . Nidhi is a riches that we enjoy , Man becomes rich and donates and enjoys when LAKSHMI devi incharge of various nidhis resides in ones house . There are 18 types of nidhis , of these six are of satvik type which are always available through the grace of LORD NARAYANA , these can be got only devotion and not through hard work or physical labour or serving some industry , army or a KING .The other type of six nidhis are obtained by wishful determination and subsequent charities and austerities towards the deities or kings or other rich men . LAST six nidhis are obtained by tamasik souls through kshudra mantras , dacoity . deciet or by doing only sins . this is the reason why sometimes we find much riches with sinners also . 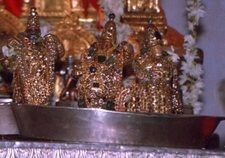 Where does this nidhi arise from , haripadakanjnishevanatllabda – obtained by continuous service offered to the feet of LORD NARSIMHA and other avataras which SRIRAGHAVENDRA swamy has served in his various avataras . What has he earned by this , PADMA NIDHI [ which encompasses all the pleasures and enjoyments ] . Because of this RAGHAVENDRA swamy who is of DEVA SWABHAV [ having qualities of devatas ] he is not like humans given to anger and desires and selfishness , but like DEvatas , who are generous and always granting wishes like divijdrum [ divine trees like kalpavriksha and paarijaat ] . Like this tree Let RAGHAVENDRA swamiji grant my all wishes always from the warehouse of padmanidhi that he has accumulated . note : one can give to others only when one has something in his pocket . SWAMIJI is virakta a a sanyasi , and also he was in a very poor condition [financially] prior to taking sanyas , nor did he have any ancestral property so how can he give ? HE has has padma nidhi which he has earned by continuous serving of LORD NARSIMHA . note there are many more meanings to this shloka , because of the lack of space and length of the post , i have limited my discussion and analysis , scholars should forgive with a large heart at my alpaprayatna .